The platform “jump and run” genre has long been a staple arcade genre for good reason. It provides a nice interactive experience for your HTML5 game and is relatively easy to modify for many different kinds of games. The essential element of a platform game is — well — platforms. The action usually happens with a side view and a player character that responds to gravity. Normally, the player will jump around on platforms and fight enemies by shooting, jumping, or melee combat. My prototype shows the essential features. It includes a player character that can jump and land on platforms. Draggable platforms are included so you can edit the scene and see how the character interacts with various platform configurations. The key to a side-scrolling game is the jumping and landing mechanic. Use a falling property to track whether the character should respond to gravity or not. Here’s the code from the checkKeys() method that reads the up arrow and makes the character jump. The checkFalling() function checks each of the blocks. If the character is not touching any of the blocks, set falling to true. This will make the character fall once it moves off of a block. Move the element as normal. Do the calculations to move the object (in this case the character) as normal. Note that the character isn’t drawn yet, but new x and y values have been determined by adding dx and dy. Check to see if the character has collided with anything (in this case, each block in the array of blocks). If a collision occurs, back up the character. You’re checking for a collision, but you don’t want the character to overlap with the block. Instead, you’re interested in knowing whether the current motion vector would cause a collision. Subtract dx from x, dy from y. A collision has been detected, so detract that collision by subtracting the motion vector. This results in the sprite being where it started before the collision was detected. Set the sprite’s speed to zero. Set the sprite’s speed to zero so the next frame doesn’t cause the sprite to crash into the block again. Use multiple levels. The default blocks are easy to build and work with, but they aren’t very interesting. Experiment with different block shapes and positions to build interesting levels. You can store the block positions in arrays to make new levels, and simply reuse the blocks. Consider a tile-based approach. 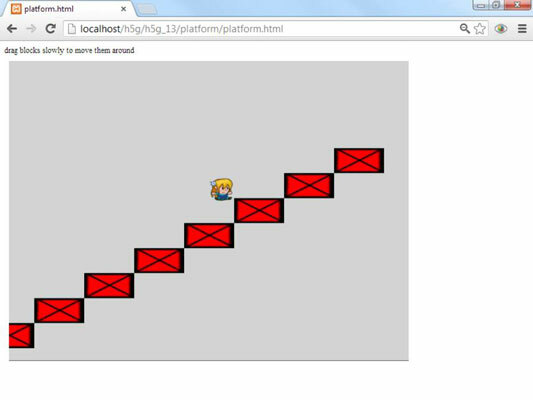 The platform example uses an arbitrary block placement scheme, but you can also use a tile-based approach. Add goals and enemies. An obvious improvement to this game would be to include some goal to reach with some obstacle in the way. Consider how you might implement enemy characters. Will they move? Will they shoot? Also consider adding powerups to improve jumping speed, add a ranged weapon, or whatever else you can imagine. Add more firepower. Add a weapon to the character so it can shoot. In side scrollers, the weapon normally fires horizontally, but you can play around to get the behavior you want. Improve the physics. The dynamics of this game work pretty well, but you can improve them with a bit more tweaking. Follow the general outline of the existing program, but see if you can make it work exactly like what you want.